Designers use White as there go to color; a clean, fresh canvas that works with any combinations of colors or can stand alone and be the star. The color of a wall makes the biggest impact on a room’s visual appearance. There are a lot of important issues when tackling a room such as scale, lighting and architectural challenges, so why not start with the basics by using a white canvas. We’re not just talking about a builders white, but a well thought-out plan of using multiple shades of white. The trick to pull off an all white room is to use darker whites on the floor, medium whites on the walls and the lightest whites on the ceiling and trim. The motivation to use white as your canvas is to show off the more important elements in the room, such as, furnishing and art work. There are many popular whites such as Benjamin Moore’s: White dove, China white, Linen white, Mascarpone white. Color Trends 2016 uses contrast to define space that creates interest. When white is contrasted with black, a classic color combination, it makes any room sophisticated, chic and timeless. High Chroma colors such as, Ravishing Red 2008-10, Banana Yellow, and Patriot Blue are all apart of Benjamin Moore’s Color Trends for 2016. Using “Simply White” with these saturated, bold colors to create angles and edges that become sharply defined by adding energy and life into your decorating scheme. 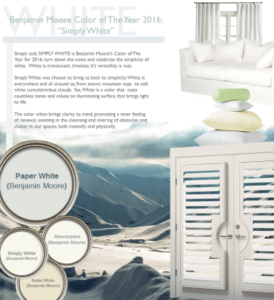 There are 4 colors of white that are a part of the 2016 Color Trends; Ballet White, Mascarpone, Simply White and Paper. Each one cast a tone of its own; creating color-enhancing canvases for dynamic spaces. The color White represents peace, tranquility and purity. It’s time to bring White back into your life.